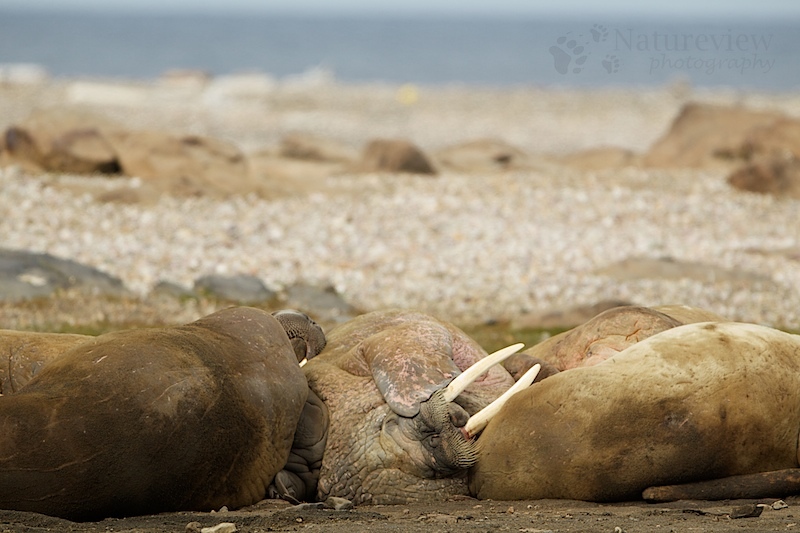 One of the characteristic animals in the Arctic: the Walrus. Not as charismatic as the Polar Bear, but also a true Arctic specialty. They feed on molluscs that they collect at the sea floor, around 30m deep. They stay for around 8 minutes at the sea floor, sucking out the flesh from the molluscs. The rest of their time, they spent hauling out on a beach. There they stink, scratch themselves, poke their neighbours with their tusks and sleep. When I see them, it’s most of the time during one of those activities. At those times they are just big lumps of blubber on the beach, not that exciting to take pictures of. In this picture you see several males laying side by side, waiting for something to happen.